Right on the Beach! Very Nice and Just Steps to the Sand! Right on the beach and only steps to the sand! This Comfy 2 br/ba 4th floor condo beach retreat is located at the popular Kanai A Nalu complex in the quaint harbor village of Maalaea! 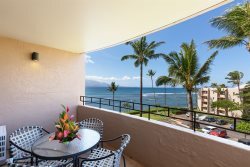 Features direct beach access to the longest sugary golden beach on Maui that's suitable for all water activities and watching whales (during whale season) as well as located in the most central location to all points of interest that a traveler would want to explore. Condo is spacious and comfortable, kitchen is more than well stocked with all the comforts of home. Property managers (I Go Maui Vacation Rentals & Realty) boast to provide a very clean, comfortable, well stocked and maintained accommodation. The goal is for travelers to arrive happy and leave happier. The property was a perfect location for us. In the middle of everywhere we wanted to go yet out of the way. The condo had great beach amenities. Loved the kitchen and rooms. Perfect set up for us. The view was amazing. Nice pool (a little chilly) but it was nice. The quiet beach was the best part. We loved this condo! The unit, as well as the entire complex, are well maintained and beautiful! You cant beat the central location of this property, the ocean views, pristine pool, and uncrowded, family-friendly private beach. The condo had everything we needed to make our stay comfortable and enjoyable. The kids played for hours on the beach with the boogie boards and sand toys while we relaxed in the beach chairs. We would definitely book this condo again! The first thing I need to say is that I booked this place believing that the photo's were of the best unit in the complex (and we would be in something different). I was wrong.... I sat in this exact spot every morning while drinking coffee. It's the real deal! Even though this is partially owner occupied and rentals, the mix of people were perfect for our family (2 Adults and 4 young Kids). The unit was clean, and had everything we needed. The kitchen was good for general cooking, and the BBQ's down by the pool are amazingly maintained each day. We're already planning for a return visit. Thanks to everyone who made our trip perfect!! Nice, Convenient Apartment with a Pretty View Spent 6 nights in 9/2018. Loved everything about this apartment. Roomy, cleaned, pretty, nice view, right on the beach, big kitchen fully equipped. Short drive to everything, quiet, relaxing. There is only one AC in the living but it is good enough since all rooms has fans and windows have screens so we can open and let the fresh wind in. We loved the big lanai with beautiful view and 4 chairs and a small table so we could enjoy our morning exercises and breakfasts or late evening drinking wine. The lock key box is convenient for checking in and not to be afraid of being lock out. We ended up loosing one of the keys anyway but property management was so nice, did not charge us for that. Andreas (Customer Relations) even stopped by and gave us another extra key. Thanks so much Andreas. We had a fantastic experiences with this rent for our first time in Hawaii and Maui. Nguyen's family. Excellent! Lovely views, very comfortable accommodations. Beautifully kept grounds. Would highly recommend. Amazing!!!!!! This is by the far the best place weve ever stayed!!!. The location is abosutely AMAZING and the view couldnt be more Perfect!!! We enjoyed the view of the Pool from the balcony and the Added Bonus the Beach is only yards away from the property. Lets not forget the Condo unit itself, Very Comfortable place to stay, clean and well stocked kitchen! Our vacation felt really like a vacation while we were staying here and the whole process to rent was super easy and simple!!! Andreas is always quick to respond via email. Thank you Andreas for making this renting process smoothly and definitely made our our Maui vacation trip worthwhile!!! Our family had a Wonderful Maui Experienced here and We will be back for sure. Great condo complex with a very nice pool and wonderful Long Beach. We stayed in June and it was perfect for our family. The parking was convenient. It was great to walk down the steps right into the beach. My kids played for hours each day in the waves. The pool was nice, it would be nice if it opened at 8 am instead of 9 am. Our condo was very nice, comfortable beds and very well supplied. We would stay again. Great down to earth place. We love this condo complex. This was our second visit. It is a quiet (but not too quiet) place. It was welcoming for renters and we did not get any dirty looks, lots of other Rentals here. The common space by the pool with Grass, Nice BBQ's and tables to eat at were a nice touch for those of us who want to be outside while in Hawaii. This specific unit was up to date and decorated appropriately. Nothing to complain about. The Internet is crazy fast and the cable HDTV had most of the channels we want to watch. The NBA finals and Stanley cup were both readily available. I highly recommend. I am giving 5 stars because it is what it is supposed to be. Its not a Ritz Carlton, its a good clean down to earth Condo. Perfect location, beautiful setting, very relaxing, enjoyed our stay greatly! This place had everything on my checklist from beautiful ocean beach access, pool, close proximity to sightseeing, elevator. Andreas was easy to reach and took care of a problem quickly. Saw whales from our lanai, afternoon sun on lanai so great to have cocktails and watch for whales. Great breezes flow through unit by opening doors which keep it cool without using air conditioning. We stayed three weeks and would return again, met many nice people while sitting around the grounds. Beautiful place and awesome location! Loved staying here! Had all the amenities in the condo, great location between Kihei and Lahaina! The beach right outside the condo was great for swimming and saw lots of turtles and whales! We stayed with our two kids, ages 2 & 4, and there were lots of sand toys in the condo to keep them entertained at the beach. We will hopefully be back! Amazing spot. The views the beach the sense of community it was amazing. The condo had everything you could think of. The views and the beach was amazing. It was the most relaxing vacation I've ever had! We are now in Honolulu and regret not staying here in Maui at this place! Relaxing, great amenities, convenient location! Everything we wanted in a Hawaiian rental! We had a lovely 1 week stay with you! Thanks for thinking of all the details! From binoculars for whale watching off the scenic balcony to spices for cooking our own meals to boogie boards and beach chairs, our stay at your condo was fabulous, comfortable, and everything we wanted in a relaxing Maui vacation! Highly recommend!